In our last few posts, we looked at light machine guns and heavy machine guns. Briefly, a light machine gun fires intermediate-sized ammunition, comes with a bipod, operated by a single user and is generally carried by and used to support infantry. A heavy machine gun fires larger-than-ordinary rifle cartridges, is mounted on a vehicle or a tripod, sometimes operated by a team of people and is used against troops, light armor, buildings, low flying aircraft etc. In today's post, we will study another class of machine guns, the medium machine gun, otherwise called the MMG. A medium machine gun is a weapon that fires full-sized rifle cartridges in automatic mode. They are generally air-cooled and belt fed. They also weigh somewhere in between the weight of a light machine gun and a heavy machine gun. Typical weight for a MMG is somewhere between 25 lbs. and 40 lbs. (or 11.34 kg. to 18.14 kg.) They began to emerge towards the end of World War I, as a balance between light machine guns and heavy machine guns. Recall that in World War I, light machine guns were made to be fed by smaller box magazines and fired in bursts only. Medium machine guns were designed to be fired on automatic for much longer, but without the heavy water cooling mechanism, weight or recoil of a heavy machine gun. Therefore, a medium machine gun offered flexibility to be used with a bipod by infantry like a light machine gun, or mounted on a heavier tripod or vehicle and used similar to a heavy machine gun. For this reason, a medium machine gun is sometimes referred to as "General Purpose Machine Gun (GPMG)" or "Universal Machine Gun". The first real MMG was the Browning designed M1919 medium machine gun. This is a weapon that fires .30 caliber rifle cartridges from an ammunition belt. It was designed as an air-cooled variant of the M1917 heavy machine gun. Unlike the M1917 which weighs 103 lb. (47 kg. ), the M1919 only weighs 31 lbs. (14 kg.) The minimum number of people needed to operate it is two, but sometimes upto four people were involved: a gunner (who fired the gun and also carried the tripod and some ammunition, when moving the gun), an assistant gunner (who fed the ammunition and carried the gun, when on the move) and two other people to carry extra ammunition, barrels, tools etc. 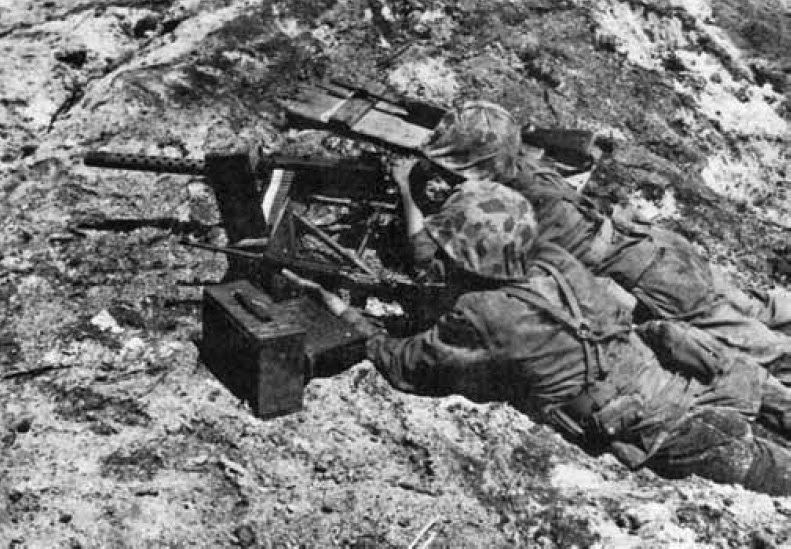 US Marines operating a M1919 A4 during World War II. Click on the image to enlarge. Public domain image. This weapon was heavily used in World War II by different branches of the US military. It was used by infantry troops, mounted on jeeps, tanks, armored personnel carriers, aircraft etc. and continued to be used well into the Vietnam era. It was also used by other military forces around the world and modified to take other rifle cartridge calibers as well, such as .30-06, 7.62x51 NATO, .303 British, 7.62x54 mmR etc. In fact, it is still in use in some parts of the world. In our next post, we will look at some more medium machine guns.